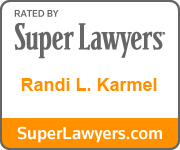 From 1991 through 1996, Ms. Karmel served as an Assistant District Attorney in Kings County, where she litigated and investigated misdemeanor and felony cases and advanced the Domestic Violence Bureau, Investigations Bureau, Felony Trial Bureau and Major Narcotics Investigations Bureau, among others. She subsequently served as Special Counsel at the New York City Department of Investigation, where she was later promoted to Deputy Inspector General. 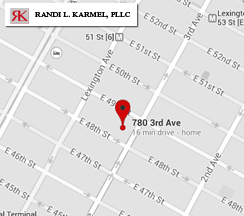 She entered private practice in 1997, and established Randi L. Karmel, PLLC, in 2006. 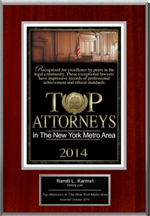 Ms. Karmel received her law degree from the American University, Washington College of Law and is admitted to practice before the Courts of the State of New York, New Jersey, Maryland and the District of Columbia. She is a member of the Family Law Section of the New York State Bar Association, the Family Law Section of the Brooklyn Bar Association, and the Women’s Bar Associations of New York and Kings Counties, and serves on the Executive Committee of Judges and Lawyers Breast Cancer Alert. She has lectured on matrimonial issues in conjunction with financial programs designed to protect assets and retirement benefits.